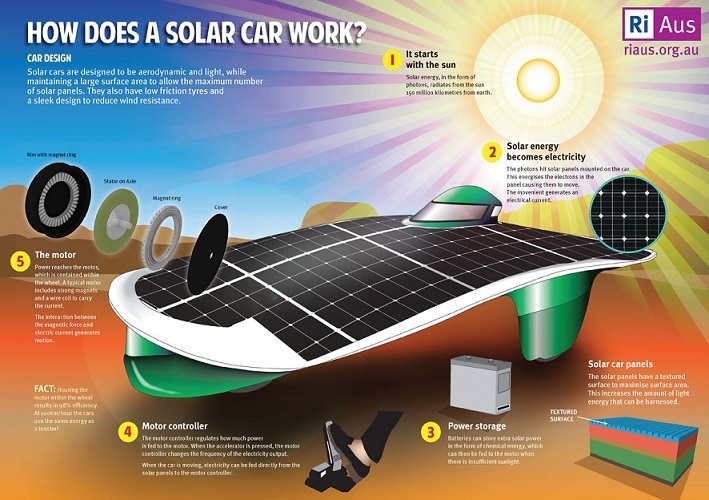 How Does A Solar Car Work? Some of our young readers/viewers/visitors are very interested in the World Solar Challenge 2013 and have written to find out more about how solar cars are built and how they work. So I spent a good part of the day, digging through all of my accumulated videos and photos, looking for graphical images and videos that would help to satisfy their request. 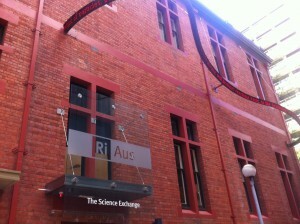 Luckily, during World Solar Challenge 2011 in Australia, I encountered some wonderful people working at RiAus (Royal Institution of Australia). Starting with the Sun: Solar energy, in the form of photons, radiates from the sun 150 million kilometers from earth. Solar energy becomes electricity: The photons hit solar panels mounted on the car. This energises the electrons in the panel causing them to move. The movement generates an electrical current. Solar car panels have a textured surface to maximize surface area to increase the amount of light energy that can be harnessed. Power storage: Batteries can store extra solar power in the form of chemical energy, which can then be fed to the motor when there is insufficient sunlight. Motor controller: The motor controller regulates how much power is fed to the motor. When the accelerator pressed, the motor controller changes the frequency of the electricity output. When the car is moving, electricity can be fed directly from the solar panels to the motor controller. The motor: Power reaches the motor, which is contained within the wheel. A typical motor includes strong magnets and a wire coil to carry the current. The interaction between the magnetic force and electric current generates motion. This entry was posted on Monday, August 26th, 2013 at 5:28 AM	and is filed under Educational. You can follow any responses to this entry through the RSS 2.0 feed. You can leave a response, or trackback from your own site.